Last year gas price per gallon spiked higher due to the Libyan crisis. This year shenanigans of the Iranian government have sent the price of gas higher. Higher prices at the pump are an automatic tax on the American consumer, but would a spike in gas prices send housing sales into a slump? This year hopeful signs of a growing ( albeit slowly) economy has many thinking the worst of the housing crises is behind us. 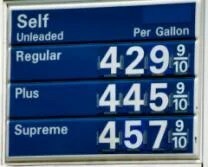 Any hopes of a real housing recovery would be in jeopardy if gas prices reach and stay above $4.50 for 9-12 months. 1. FHA loans have become a greater percentage of loans in the home purchase market over the last few years. Yet, even with the historically low-interest rates we have seen in the last few years, home purchases have not picked up because we don’t have enough qualified home buyers. Now, FHA loans have become more expensive over the last year as mortgage insurance rates have risen from 0.55% to 1.15%. Therefore, any additional costs to the consumer will make it that much tougher to take on new mortgage payment. 2. A big spike in gas prices negatively affects GDP. A long period of higher fuel costs could shave 1% off the GDP numbers. This retraction, in turn, has a negative effect on the American consumer, whose confidence in the economy is necessary for a home buyer to leave the sidelines and take the leap into home ownership. 3. Because irresponsible loan products are gone, home buyers have more skin in the game. Also, homeowners realize that a home once purchased is not easily sold, therefore the ability to handle monthly payments is a much greater consideration than it was in years previous. Potential home buyers will be looking closely at their monthly expenditures, and a spike in gas prices which if looks permanent, will result in less money for a mortgage payment and other items. Higher prices for a prolonged period will also be a psychological deterrent, as the reality of higher energy cost each months becomes more legitimate. In summary, any short-term spikes up and then down in the price of gas will be absorbed by the consumer without an appreciable effect on the housing market. However, any long-term rise in the price of gas will eventually erode consumer confidence to the degree that a hoped for housing recovery could be pushed further into an uncertain future.